The following is the text of "Fifty Years Of Storage Innovation: Magnetic Tape & Beyond," a copyrighted booklet published by IBM in 2002. In the words of the booklet's author: "This historical perspective is dedicated to the people who made the first tape drive possible and to those who continue that tradition in the Removable Media Storage Solutions team of IBM." The images used in this text did not appear in the original publication. June 1949: Recorded music was on 78 rpm platters and "wire recorders" were the mainstay of radio. Magnetic tape had only recently emerged from the laboratory into a few broadcasts. A room full of vacuum tubes and miles of wire accomplished what a handheld calculator would be able to do faster by the 1980s. Information storage meant books, filing cabinets or -- to those at the leading edge of data processing technology -- paper punch cards. Reels of tape, tape cartridges and programmable computers were the stuff of science fiction. IBM was about to change all that. A more compact means of storing data permanently had to be developed. The U.S. Social Security Administration was pressing IBM to solve this record storage problem -- acres of filing cabinets filled with punch cards containing social security data about every working American. 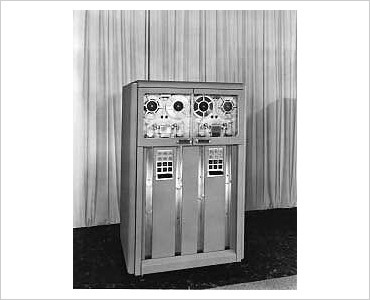 Wayne Winger, team member on IBM's first tape drive, spoke of the limitations of punch cards, "There were 80 characters per card, and a good speed was 100 cards per minute." That's 133 characters per second. The first marketed tape drive from IBM, the 726, operated at 7,500 characters per second -- 56 times faster than the punch card rate. The IBM 726 Magnetic Tape Recorder Byron Phelps, patent holder and principal figure in developing magnetic tape, recalled, "We had tried more dense paper cards for data storage, but the improvement was only a few times better. Punched paper tape offered no great advantage either. Magnetic tape had just come into its own in audio and offered the most promise." Even at the first working density of 100 bits per inch on a half-inch wide tape, a 10.5 inch diameter reel of tape could hold the equivalent of more than 35,000 punched cards. In 2002, the IBM Ultrium LTO tape cartridge is 1,000 times faster and stores more information in one inch of tape -- without data compression -- than the 726 tape drive was capable of storing on over 500 feet of tape. It was by no means clear that wisdom lay in gambling millions of dollars, the careers of some of the brightest engineers in America, to say nothing of the future of the 35-year-old IBM Corporation, on the infant technology of magnetic tape that was based on gluing bits of rusted iron onto strips of plastic. The suggestion that such a vaguely understood technology as "magnetics" could supplant the familiar and highly profitable punched card met with strong and vocal opposition within the company. Some of the most highly respected and positioned figures within the IBM Company were convinced it was foolish. Winger recalled, "A white-haired IBM veteran in Poughkeepsie pulled a few of us aside and told us, 'You young fellows remember, IBM was built on punched cards, and our foundation will always be punched cards.'" Opponents of the magnetic tape program had well-developed arguments against it. For example, Phelps recalled someone "preparing a study on possible tape density and producing a graph showing that 400 bits per inch was just about the ultimate recording density we could hope for!" Today, the IBM Ultrium LTO tape cartridge records more than 124,000 bits per inch, and densities of over 250,000 bits per inch seem feasible in the near future. Tom Watson Jr., by then executive vice president of IBM under his father T. J. Watson Sr., immediately grasped the promise of magnetic recording as a result of his experience with electronics in the Army Air Corps during World War II. He and a number of the company's top engineers and scientists decided that the gamble of moving to magnetic tape had to be taken. According to one IBM Fellow, Nathaniel Rochester, Watson Jr. "went all around the room asking people if it was the right thing to do or not ... And some people said 'yes' and some people said other things. Then he told all those people who said other things that maybe it was time they work on other problems."